Becoming Healthier with Sherrie: Are You Ready To Change? I Know Who Can Help! I hear this a lot, "I wish I could do what all you do." or "You've got such great willpower, wish I could turn down food so easily. ", and I used to think the same thing about others. Before becoming a part of the Fitness Together family, I really thought it was that I had no willpower or the ability to make the changes I needed to be successful. But, at 350 pounds, I thought I better find it! I've learned so much in the past three years, but one thing I've come to realize, is that it's not that I didn't have the ability or the willpower before; but, I just wasn't ready to change. 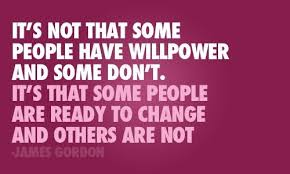 We all have different reasons that will cause us to be ready to change, it could be family, friends, a health scare, etc. Or, as it was for me, you realize if you don't change you're at a high risk of being diagnosed with things like diabetes or heart diseases because these things run in my family. I'll admit, three years ago when I walked into FT and talked with Michael, I didn't know if I was going to be able to be successful and I even opted for the smallest three month package. But, I also went in there knowing I was going to do everything they told me to do, and at the end of that three months if I didn't go back I would know I gave it all I could. But at the end of the three months, because I was ready to change and I listened to the trainers, I was not only getting great results but I was feeling better than I had ever felt before! It was a no brainer that I continued to commit everything I could, not only to Michael and Fitness Together, but to myself! Next time you see someone getting great results from working out and eating healthy and you think to yourself "wish I could do that", just remember, YOU CAN DO IT!!!!! It's not a question of if you can do it, but the question is are you ready to do it! So, are you ready to change? If you are, I encourage you to contact Michael Watkins (owner) or Keith Jacbos (manager) here in the Tulsa area at Fitness Together Jenks/Riverside or Fitness Together Downtown. Not in the local Tulsa area? Then you can find a local Fitness Together by clicking HERE, I promise, you won't regret it!